Barszcz is the generic Polish term for any sour soup. Beet barszcz and white barszcz, made with kiełbasa-cooking water, are the most common. 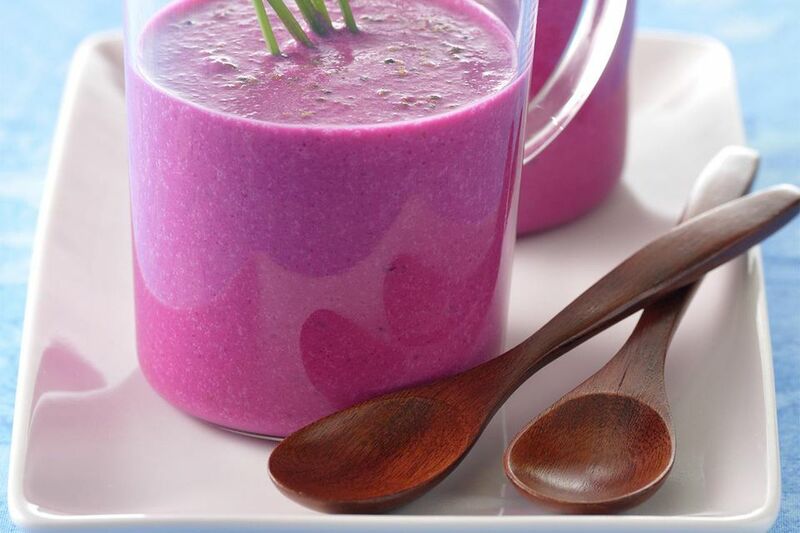 This recipe for creamed beet barszcz is a brilliant magenta color that can be made with fresh beets or canned or jarred beets. The sourness comes from sour cream instead of vinegar as is common with other recipes for barszcz. Serve this warm or cold garnished with additional sour cream, dill, and julienned beets if desired. It's so refreshing on a hot day when ice cold! Heat oven to 400 F. Wrap beets in aluminum foil and roast until tender, about 30 to 45 minutes. When cool enough to handle, peel and slice. In a medium pot, bring the stock to a boil, add the beets, sugar, and salt and pepper to taste. Bring to a boil, reduce heat and simmer 10 minutes. Transfer to a blender or food processor and puré until smooth, and return to pot. Mix sour cream with flour until well blended. Temper the sour cream mixture with a ladle of hot soup, whisking constantly. Transfer the tempered sour cream to remaining soup and whisk until smooth. Simmer to cook out the raw flour taste and until the soup is thickened, but do not boil vigorously. Serve immediately or cool quickly in an ice-water bath and refrigerate to serve cold. Garnish with dill, julienned beets, and sour cream.